Ludwig Bemelmans is today remembered primarily for his children's book series starring the little schoolgirl Madeline, but before he hit it big he did quite a bit of advertising work. This full page Jell-o ad from early 1932 is, to me, his most remarkable advertising cartoon. The ad really jumps off the page, making the surrounding strips look positively sad in the comics section. Unfortunately, because ad strips aren't really within the main thrust of my research, I can't tell you if this was part of a series or not. 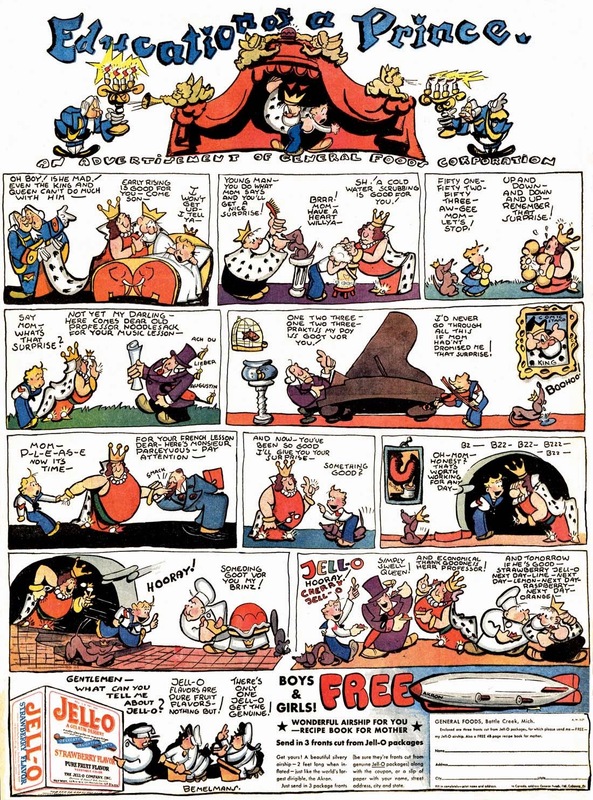 I know I've seen these lovely ads on plenty of occasions, but I never made notes on them so as to determine how many different strips there may have been in the series. Anyone? The Bemelmans Jell-O ads were definitely a series, I found several examples from the San Antonio Light over at Newspaper Archive. I don't know exactly how many different ads that Bemelmans created. I like the offer of a model of the AKRON. maybe further entries will show the R101 and the HINDENBERG.